Warning, this post may add calories just by looking at it!!! It's started to chill down slightly, not too bad yet - we are still have 18-20 degree C days but slightly cooler overnight. We've had the fire going a couple of times, and as much as I loathe cold weather there is something lovely about the warm fire and winter dinners. Roast Beef with perfect Yorkshire Pudding was the first winter meal request. My Yorkshire Puds are pretty tasty! The other half had a birthday, chocolate cake was the request from the children (although I knew he'd secretly prefer Carrot Cake - but to keep the girls happy Chocolate it was). 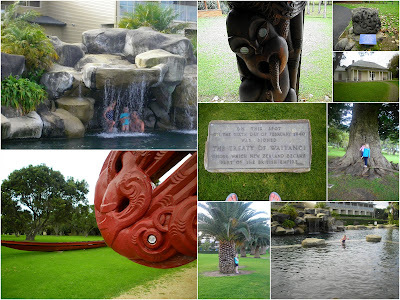 We went away for a lovely family weekend just an hour north of here in Waitangi. The girls loved the hotel - especially the swimming, and I just loved the chance to have a wee change of scenery for 24 hours. No crochet to show sorry, I've just bought an e-reader so I've been spending my spare time reading a few ebooks - loving it! Love that I can now take all my patterns with me on the Kobo though without having to print out paper. So handy. Head on over to my lovely friends Becs' blog "Born Again Creations" to check out her gorgeous giveaway - she is so super talented! I found your blog, and just loved reading it ! I like the combination of home recipes and crochet stuff, jewelry making, and all lovely creativeness. Although I live on the other side of the globe, I think we have the same interests - I am a follower ! greetings from Belgium, rozemie. Right, if I don't fit my jeans tomorrow I know it will be your blog to blame!!!! Look at all that foodie goodness. Wish I could be there to eat cake with you hon.